Highest quality playground material available! Clean, small pulpwood chips that are ground down to a uniform chip size of 1 inch or less. Naturally light in color and meets ASTM standards for playgrounds. Soft and Springy. Can be used for play areas, walking paths and kennels. 2 cu. ft. bag–$4.95 ea. Or Full Pallet (60 bags)–$4.50 ea. Mixture of reed sedge peat and composted animal (grain-fed) manures. Specially formulated for growing hearty, nutritious vegetables and gorgeous flowers. Contains reed-sedge peat, sphagnum peat moss, horticultural perlite and fertilizer. Can be used for transplanting established plants into larger containers and for planting slips and cuttings. Processed from Indiana’s finest hardwood bark & wood fiber and manufactured at our site. Rich Dark chocolate in color and double shredded to approximately 1-2 inches in size. Decomposes over time to make an excellent soil amendment. 2 cu. ft. bag–$3.85 ea. Or Full Pallet (60 bags)–$3.25 ea. 1-2” Wood Fiber Mulch that is generously dyed with a long lasting color retaining dye. Using “Color-Safe Technology” these dyes are not threatening or hazardous in any way to shrubs, plants, pets, or children and generally retain their color for much longer than natural mulches. 2 cu. ft. bag–$3.85 ea. Or Full Pallet (60 bags)–$3.50 ea. An aerobic-composted product for use in potting soils. 2 cu. ft. bag–$4.95 ea. Or Full Pallet (68 bags)–$4.50 ea. A unique mixture of polymer binders and calibrated crushed stone available in two colors: Sahara Beige or Stone Grey. 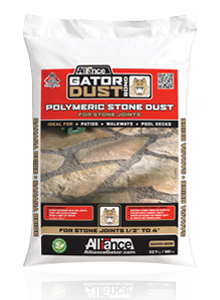 Once Gator dust sets, it becomes very firm and locks between stone joints. This firm bond maintains the stones securely in place, being equally effective on both horizontal and sloped surfaces. 1-2″ Wood Fiber Mulch that is generously dyed with a long lasting color retaining dye. Using “Color-Safe Technology” these dyes are not threatening or hazardous in any way to shrubs, plants, pets, or children and generally retain their color for much longer than natural mulches. 2 cu. ft. bag–$3.85 ea. Or Full Pallet (60 bags)–$3.50 ea. **Dyed mulches contain dye/color additives that need a certain amount of “drying” time after installation & before a rain or watering. Please allow 24-48 hours for curing or drying after mulch installation to assure no runoff or discoloring. Also, please do not dump or store dyed mulches on concrete surfaces due to the potential for permanent staining. The Best Florida Has To Offer! Cypress shipped from the Deep South, blonde/gold in color and shredded to a consistency of 3 inches or less. Retains color and longevity more than most mulches. 2 cu. ft. bag–$3.85 ea. Or Full Pallet (80 bags)–$3.25 ea.